Sculptures of the Hindu god Shiva were common during the Angkor period (9th–15th centuries). Shiva’s popularity was the result of the god’s indisputable cosmic power and association with fertility. To this end, Khmer kings of the Angkor period often claimed to be the reincarnation of Shiva on earth. Images of Shiva are easily identifiable by their iconographical attributes, which include the third, vertical eye, symbolic of his ability to destroy desire, and his mound of matted hair, a marker of his asceticism. Sculptures of Shiva dating to the Angkor period typically reinterpret the god’s dreadlocked hair as a multi-tiered chignon, reminiscent of royal headdresses. Monumental and imposing, this freestanding figure represents Shiva, one of the three most important Hindu gods. Although his hands and the objects they once held are missing, he can be identified by the vertical third eye in the center of his forehead, which represents knowledge and fire. According to his followers, Shiva is the root and support of the universe and is responsible for its endless creation, destruction, and re-creation. 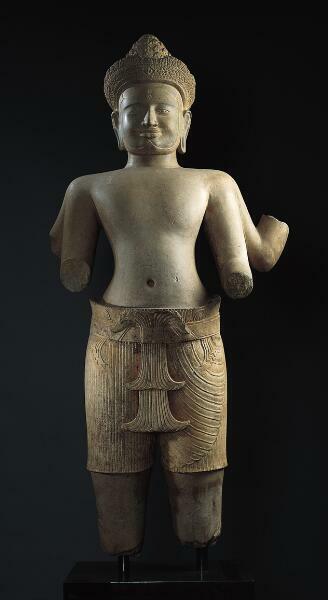 He was by far the most important deity in ancient Cambodia and was normally worshiped in a linga or phallus form. Although Shiva’s expression looks somewhat distant here, his slight smile is benevolent, accentuated by the graceful line of his mustache. The mustache and beard are typical of sculpture created from the 9th to 13th centuries in Cambodia during the Khmer empire. You won’t see them on Indian representations of Shiva. Like Khmer rulers, Shiva wears the traditional sampot around his waist, elegantly pleated and fastened with a plain belt. The sampot juts out from his waist, with the extra material forming an elaborate swag in the front.